If I had to think about it, I would have imagined there comes a time in a parent’s life when she realizes her job is done. She’s raised the kid she hoped, she’s instilled what she was supposed to. Or goodness forbid, you’ve raised the kid and now there is nothing else you can do about it. Maria brought home some of her school work yesterday. She is nearly a month into her elementary education. The “story” she wrote gave us a jolt of joy, a realization that hey, when it comes to self-esteem and girl power, we may just be done…for now anyway. Girl Powr, gente, Girl Powr. That is simply awesome. And I love her illustration, too. Just wond'rful!!! 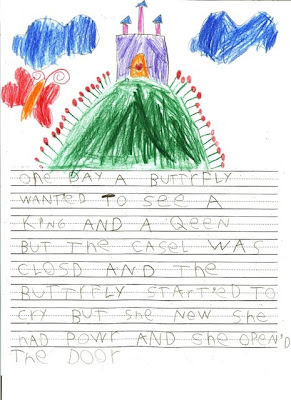 Girl Powr Maria :) … the detail on the buttrfly is amazing …"and the buttrfly realized she was the queen!" I read your column on my reader and had to come and leave a comment. Awwwwwww! You brought a tear to me eye. I remember my youngest son first story. oh dear I'm going to cry. I am so proud of my girls, my heart is full of joy. Good work mami of the butterly!